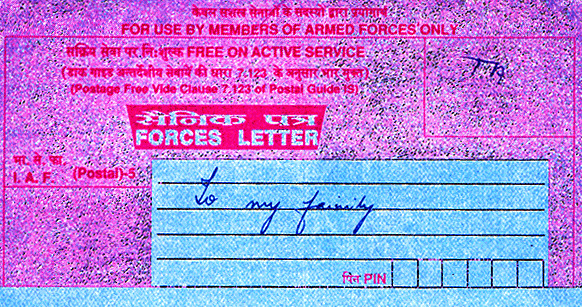 Reaching out to his family was the most toughest phase of my life..10 years after the war had ended, I wrote his father this email which proved to be the most toughest 3 hours of my life as i could not stop crying after writing few words and my vision blurred every few seconds....but I knew I had to do, I had to make them known that what I felt..
Hello uncle, i do not know from where to start?? But whatever i do i am sure of one thing that i am and would always be proud of every defence person serving and protecting even a small stone in INDIA. Kargill was no mean feat in any way and i would always be grateful to everyone who did what they did in kargill. 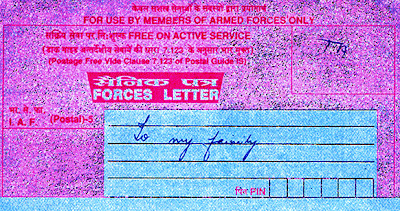 When kargill happened i was just in class 10th, 10 years later i am 24 but every moment just lingers in my heart and mind.All i was hoping these years was to find some means by which i thank the families of the marytrs who laid down their lives for their country and today i would be saluting a father of a brave soldier capt. 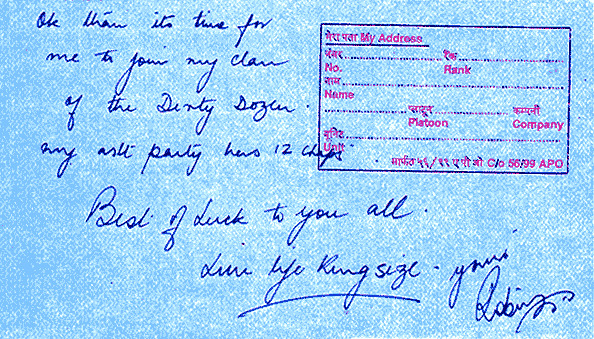 vijayant. i might not remember his feat vividly but his words from his last letter are more than etched in my mind. what he did was just exemplary courage .......just awesome. i might not have the same courage as him but i do know one thing that it is because of people like him that i can still sleep in peace everyday and every moment without fear. i read your interview in navbharat times in which you said that people are erasing this supreme sacrifice from the memory. can`t say about them but me and my friends would be always be indebted to him forever and ever. 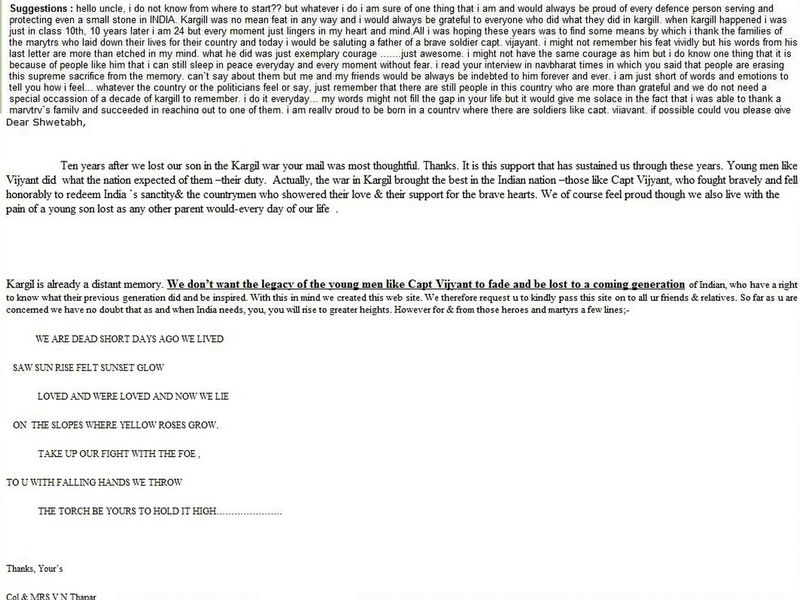 i am just short of words and emotions to tell you how i feel... whatever the country or the politicians feel or say, just remember that there are still people in this country who are more than grateful and we do not need a special occassion of a decade of kargill to remember. i do it everyday... my words might not fill the gap in your life but it would give me solace in the fact that i was able to thank a marytry`s family and succeeded in reaching out to one of them. i am really proud to be born in a country where there are soldiers like capt. vijayant. My salute to capt. vijayant. 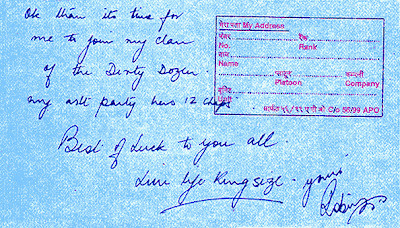 Ten years after we lost our son in the Kargil war your mail was most thoughtful. Thanks. It is this support that has sustained us through these years. Young men like Vijyant did what the nation expected of them –their duty. Actually, the war in Kargil brought the best in the Indian nation –those like Capt Vijyant, who fought bravely and fell honorably to redeem India `s sanctity& the countrymen who showered their love & their support for the brave hearts. We of course feel proud though we also live with the pain of a young son lost as any other parent would-every day of our life . ON THE SLOPES WHERE YELLOW ROSES GROW. THE TORCH BE YOURS TO HOLD IT HIGH…………………. On 28 June 1999 Captain Vijyant Thapar was commanding the Leading platoon of Alfa Company, which was tasked to assault area Knoll in Drass Sector from the north during Operation Vijay While advancing, the platoon was hit by accurate enemy artillery barrage and it suffered heavy casualties. Captain Thapar organized evacuation of the casualties and quickly rallied his shell-shocked platoon for the attack. Personally leading the attack from the Northern face against enemy's Medium Machine Gun fire, which was holding up the Company's assault, he fearlessly charged at the enemy position firing from the hip and throwing grenades. During this act, he was grievously injured in the hand and stomach but continued to advance ordering his men to follow him. Roused by the actions of their young Platoon Commander barely out of the Academy, the platoon charged up the hill against the dominating enemy position. This audacious action unnerved and forced the enemy to abandon a tactically superior position. The officer, however, succumbed to his injuries. Captain Vijyant Thapar, thus, displayed remarkable cool, raw courage and exemplary valor and made the supreme sacrifice while facing the enemy. Capt. Vijyant Thapar...the hero whose sacrifice, legecy lives on even till today after he has gone.. I smiled as I read this post... martyrs want people to smile than be sad or despondent. Very well written. It is an amazing deed. I smiled too. It was great to read this. 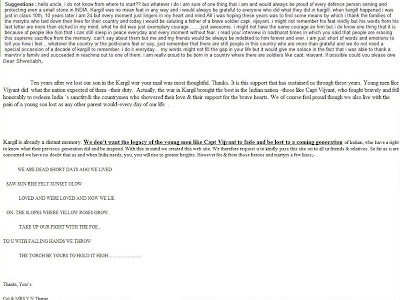 I listened to Col. Thapar speaking today at a Kargil Vijay Diwas memorial event and made up my mind to write to him (just sent off the email a few minutes back). You are right, not many people bother to reach out and even a simple email is a good way of showing the family that there are people who care. Keep spreading the word about Capt. Thapar and others. Lest we (and future generations) forget. A Hero like Captain Thapar will forever stay alive in our hearts.